You may not believe me, but the majority of DigiDame readers will own a personal drone within the next few years. 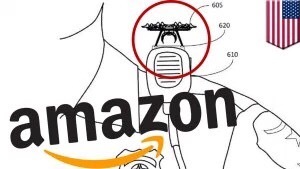 Amazon recently announced they secured a patent for a voice-controlled drone that fits in your pocket. Before you start groaning that you will be using yet another gadget, this new personal assistant could be very helpful to us as we get older. Amazon said the new personal drones will assist us in ways we never thought possible. It will help us find a lost car in a parking lot, runaway grandchildren in a park, and friends at a concert. We will be able to operate the personal drones by voice commands or via a companion app. The price has not been set yet. Amazon said the mini drones will also be used by police as assistants to record videos when needed and to follow suspects on a chase. There are many other commercial uses that will become evident as the months go by. Amazon reminded everyone that many of the uses they are projecting aren’t legal yet, but will be sometime in the future. Amazon said they only want to pursue drone uses that are safe and make sense. I always like hearing about new automated inventions, Lois. Thanks for this. New ideas from the AI sector are coming so thick and fast, that I’m beginning to question how they will affect our lives beyond convenience, and the jobs they will displace. My next blog post (tomorrow morning) addresses the driverless car. You might be interested. am for anything that makes life easier!